In education and training it's agreed that authentic assessment is the better assessment method to use. So let's go over and I will show you how to use some freeware augmented and virtual reality applications that you can have your students use create projects that demonstrate mastery of content and are engaging so that they can teach others it also. Ones I assume you all know about already, but if not you should. 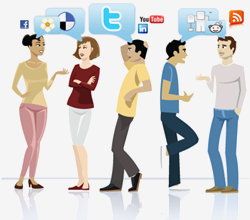 Nexters, Millennials, & Digital Natives "Oh My!" Do you find that your students are bored or fall asleep when you show a traditional slide presentation that you spent hours working on? The generations sitting in your classrooms now need more than a traditional slide presentation to keep them engaged. They need it to be interactive and to have an active roll in the process of the learning and/or presentation. After all they are wired into technology or some form of entertainment 24/7, so we've got to get and keep their short attention spans. To do that when starting off on a new unit try a free gamifcation. To learn more about gamifaction please see this article by Edutopia "Gamifaction in Education". I like to use the free web 2.0 tool Kahoot. I like it because it doesn't require special software, students can access the game questions, that in my class we call "Unit Pre-Challenges". They can access the game from any device that has internet access via the Kahoot.it. I use this when starting a new unit and I offer the "top 10" bonus points for the unit based on how well they do. I can also download the data I get from it to see where the students strengths and/or weaknesses are for the unit. Then I can adjust the rest of the unit based on this. 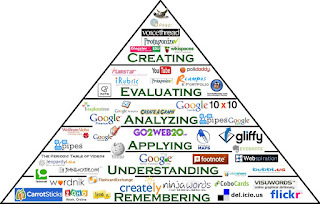 I also use a free presentation web 2.0 tool when I am introducing a new unit like Emaze or Prezi for Education. There are many more out there, just do a web search and you'll be amazed at what is available. Use whatever tool works best for you and your students. Today's students they see a traditional slide presentation as the abridge version of the text book and this is all the need to focus on. Heck often it is the textbook because few class have access to digital or traditional textbook as it is. What I do is create "Jeopardy" game that we play in class as teams or a bingo sheet. I will give them a sheet that is customized to that unit. Usually it will have either the terms, definitions, or even image of the content we are covering. They will then have to fill out this sheet, it will serve as their notes and future study guide for an end of unit assessment, if I should go that route. I only give "tests" on small or simple units. I actually prefer on major units to have them work in teams of 2-3 on a project that they present at the end of the unit. Now if you are teaching at the secondary level you don't have to worry about the "clash of generations" in your classroom. Except in how your generation, is different than the generation you have sitting in your classroom. Those of you who teach post-secondary have to worry potentially about all five (5) generations that could be in your classroom. To make it easier for you to reference I have create a generations matrix that you can view below in PDF format. The reason you need to be able to recognize the different types is because they each have their own way of learning best. There is no getting around the fact that you learn best based upon the toys they played with growing up, teaching tools that were new or innovative for their time, and any major social influences from their youth. I will often show this matrix in class and we will discuss it, it helps students and myself to realize what the learning needs are for everyone in the class. A great video I like to show at the start of a new semester is "Generation C (Gen Z)" by Geoff Belleau. I will show this and the we have an open discussion on is what he says true? How do you learn best? How can we customize learning so it helps everyone? Etc... We dedicate at least 45 minutes to this alone. This gets the students thinking about and more invested in the actual learning process, versus me standing there telling them you will learn XYZ today. I will often ask them how do their parents react to new technology versus how they do. Then I ask why do they think it's this way. Anything to get them thinking about how we all work together. Yes classrooms and students are way different now! Actually thank goodness they are different because they old sit in desk , in these rows is actually a model that was created to educate factory workers. Now a days that is not a skill that most employers want, they need problem solvers, team players, and work ethic not "drone workers". The sky is the limit for your students and your classes! You really can do amazing things in your classes if you just meet the different generations in your classes, at least half way. No your not crazy, your students really are "from a different planet", or the the least a different learning style than what you know and love. So please take the time to get to know your students and their learning styles. You can then work together to make sure they learn your content and don't just "pass your class". After all we love our content and think it's "awesome sauce" and we want everyone to think the same, or we wouldn't be teaching it would we. 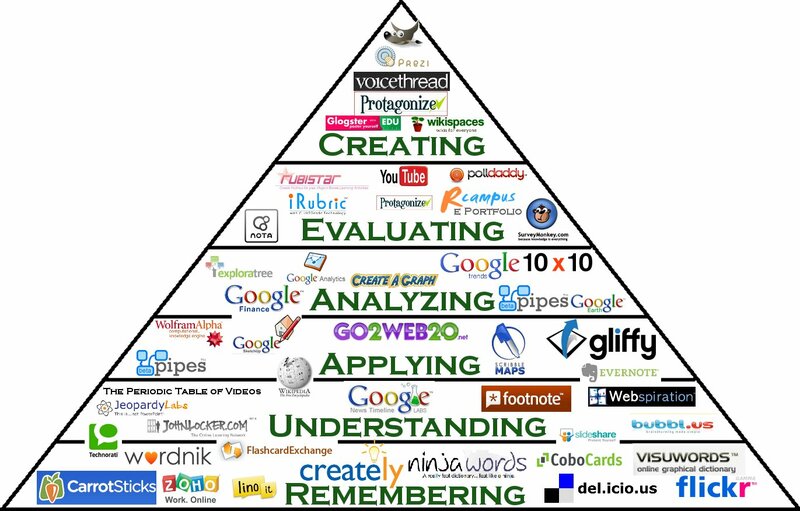 Even Bloom's Taxonomy has evolved to meet the needs of the new generations, if that can then so can you. Have you been hearing all the talk about this "new instructional method" called "Blended Learning"? What about being asked all the time "have you flipped" your class? Have you been told you will do this by your school administration, but nobody has explained to you how to do it? I've seen both experienced and new teachers both get the "OMG I'm going to blow if they tell me I need to learn one more new technology tool on my own. Grrrrrrr" Usually accompanied by other not so scholarly words. Wow, what a mouthful and a lot to digest and think about! Don't panic, essentially what they are saying is that the teacher and student uses multiple methods to deliver the education. Some by online, some by face to face, some by independent research, some of the pace of delivery is set by the teacher or school, and some is set by the student. Essentially it means you use technology to help meet all of your students learning needs. It's just a more technology based version of "doing whatever it takes" to teach your students. In all of my research I yet to find anything better than Math Johnston's "What a Flipped classroom is not" that you can find on his YouTube channel. He explains this concept is easy to understand terms for you, students, parents, and administrators. The trick to successfully blending your class so that you "FLIP not FLOP" it is to find what works best for YOU and YOUR students. There is no one way to do it or just one magic tool that works for everyone. Don't be afraid to try new things. Do NOT think that you have to use "experts videos" because they know more than you do. Believe it or not, your students actually pay more attention and learn more from your "unprofessional" videos. Also, you do NOT have to be the expert on the tools, you are already the expert on your content area. Have fun and allow your student to try new things. We learn more from fail at the first time, than what we get right the first time. Just tell them up front "We are doing this unit over XYZ. You will be excepted create XYZ, refer to the rubric I have given you. you will be allowed to use whatever tool you want to create it, just show it to me and explain why you want to use it. But be forewarned I am not an expert in that tool and you will now become the class expert on it". I promise you the time to spend to blend or flip your class will come back to you 5 fold at least. I blended/flipped my classes over 10 years ago before there was an official term to call it. I did it so I could best serve my students, after all there are 20-30 of them and only one of me. With my instructional websites and videos, the students are able to get help with a step when they need it and work at his/her own pace. Kids love it, administration love it, parents love it, I love it because I never have to explain what it is that were are doing or learning in my class. It's right there for everyone to see. My Going Green Project Based Learning Site from the CTE Summer 2014 Conf. Our First Conroe HS Lip Dub!! We're going viral! We are doing our first CHS Lip Dub to the song "Best Day of My Life" by American Authors. I'm sooooooooo excited that my campus is finally doing a lip dub. This has been a dream of mine and a couple of other staff members to do for over three years now. It's easy to find the videos, but not the explanation of how they went about creating it. Thus, the reason the post was born. The MOST important thing you need to do when you want to do something like this is = TEAMWORK! We have core team of 16 staff members who have helped with all the different parts. No one person can do it all. You have to work together! Here is our awesome TEAM and what we all did, to help make it a success. Let the people who are awesome at what they do = do what they do best. Why would I try to plan the formation of the band kids to spell out "PRIDE !" on the field? Our band directors know how to do way more cool and complicated filed formations. I have no clue how to actually video and make the scenes look cool, but others do. You sure don't want me trying to teach you how to sing or dance either. 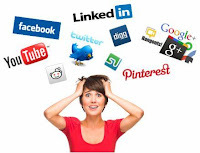 The other thing you need to do is to use Social Media to your advantage! Our campus Twitter acct., ISD acct., & counselors acct. sent Twitter tweets out bi-weekly telling students to go sign up to be a part of our video. Our campus FB page also posted links and encouraged people to join. Of course our Conroe HS campus website promoted too on our main splash page. #1 = Set-up a Google Drive folder that anyone can see http://goo.gl/ol8jpc. D. Yes you can put videos here (if your ISD doesn't have that blocked in the admin console) and use it to share the choreography steps if your ISD has YouTube blocked. C. SECURITY NOTE = make sure that you turn off "Share with anyone who has the link" for the Google Form results. Only three of us have access to our data. D. Don't forget to "turn off" accepting responses to the form, once your due date has passed. to be able to access information. So why not give it to them the way they understand and want it? #4= Use YouTube to "go viral". A. Make sure you have gotten written permission from the author of the song to use it. We had to get this from both the author AND the publisher. We have email proof that we can use our song. Be forewarned, getting this permission took us two months! YouTube can and will pull audio from videos, if you can't prove this. B. When your Rock Star filming team gets done filming and editing post the final product on YouTube. I will share ours as soon as it gets done. C. SECURITY NOTE = only one person on your campus should keep the original finished video. We have an AP who will keep ours, part of the agreement we have to be able to use the song. I hope this helps or inspires your campus to go out and "go viral" in a positive way. Let me know how it goes for you.